I want to share with you the results of one of my little pre-baby arrival projects. And thanks to HomeGoods it cost less than $30! Really, it was just a matter of replacing the shower curtain, but what a difference! The room looks like an entirely new place with a curtain that actually matches the tile. The new curtain was $14.99. And the new shower hooks and vinyl liner were less than $6 each. I am adding a new category with this post. Disclaimer: I really know very little about Feng Shui, but I wanted an F word that could indicate household projects or decorating. So don’t come here looking for legit Feng Shui advice and you won’t be disappointed lol. What we changed: We were a little more generous with the spinach. We left out the pine nuts because even though we love pine nuts, they are just so darn expensive and didn’t seem worth the extra money this week. 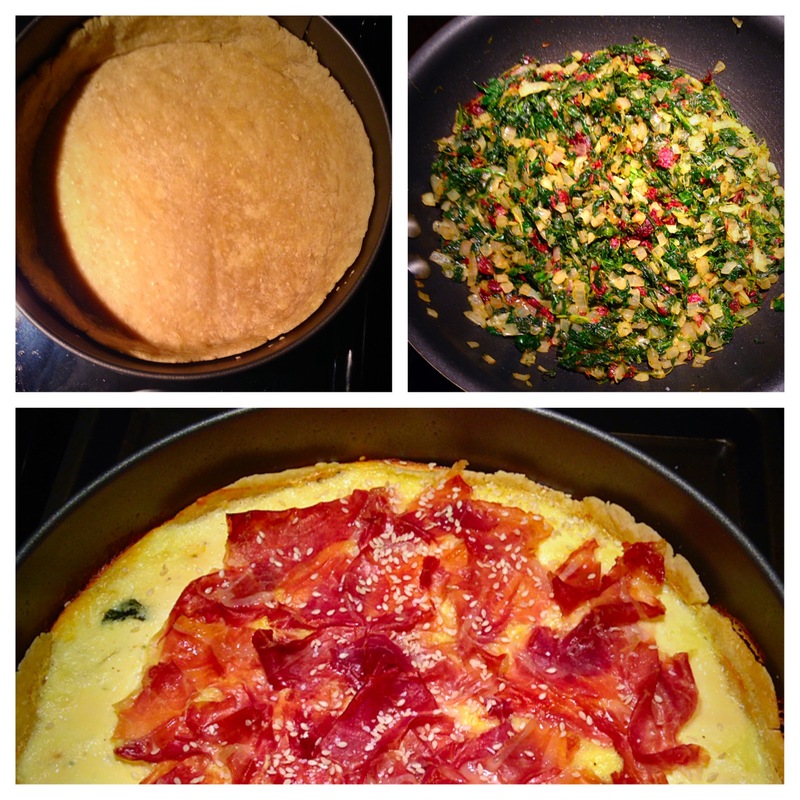 My thoughts on the recipe: I really like this recipe as a starch substitute. It made a great side dish throughout the week (you’ll see it in some of the other pics below). But I don’t think it has quite enough flavor to stand up on its own as an entree which is why I am rating it an 8. As a low-carb accompaniment it hits the spot, so I’m sure will be seen on our table again in the future. What we changed: I really just used this recipe for inspiration but didn’t follow it very closely. I didn’t make the rice. I only was making 2 pork chops so I guessed at most of the measurements in the recipe. I also used vegetable stock instead of chicken broth. 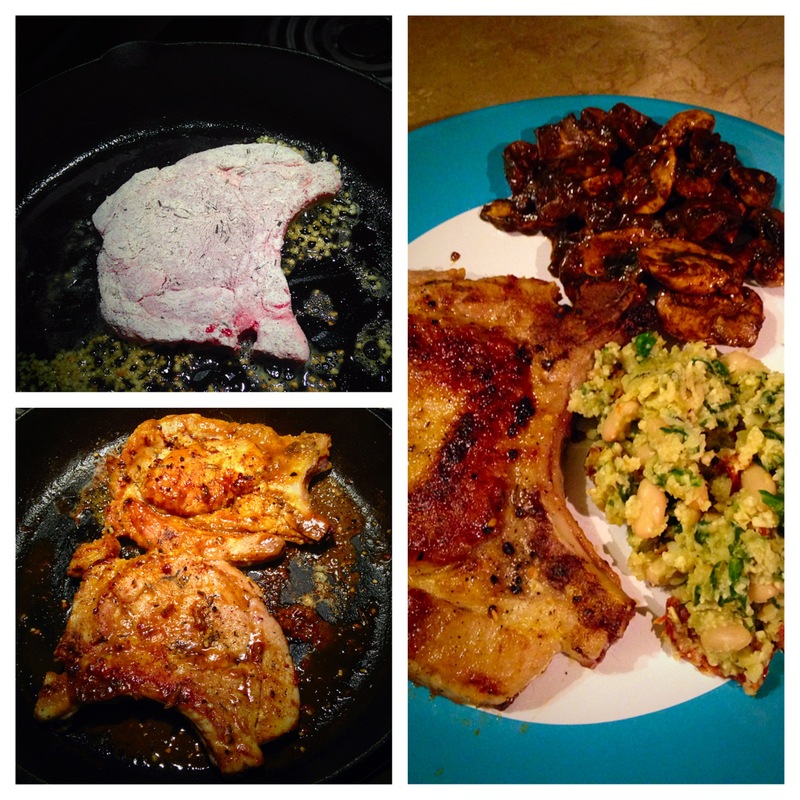 My thoughts on the recipe: These made pretty darn tasty pork chops. We served them with the cauliflower “risotto” and also sautéed some mushrooms in the pan after cooking the pork chops. What we changed: We used 1 cup of all-purpose flour and the remainder whole wheat flour. We used coconut sugar instead of regular organic sugar. We used almond milk (instead of soy) and ground ginger (instead of fresh grated). My thoughts on the recipe: OMG ya’ll. These were absolutely amazing! 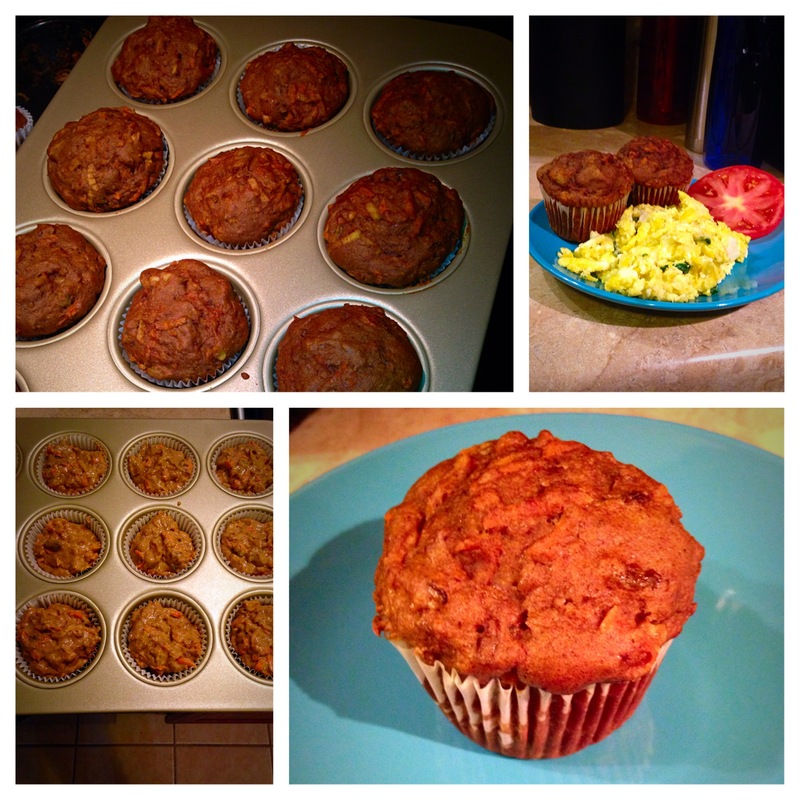 The recipe made 18 muffins for us and we have been eating them all week long. They make an excellent breakfast accompaniment (as with the scrambled eggs) or they are really delicious on their own – especially popped in the microwave for a few seconds and then topped with a bit of coconut spread. I wasn’t sure how vegan baking would be since I am so used to using eggs when I bake, but the date paste in these muffins worked wonders. They were so moist – even as leftovers after a few days they stayed moist. I highly recommend trying this recipe. And with the carrots and apple and flax you can feel good about eating them too! What we changed: The first time I made this smoothie I followed the recipe exactly and it was ok, but the second time I made it I changed it up a bit and really liked it. I can’t tell you exact measurements for the second time I made it because I didn’t measure, but I can tell you that I left out the vanilla and the honey the second time. I used a little less coconut but was more generous with the chia seeds. I also used two bananas instead of 1 and no ice. But I did use frozen mango (a 10 oz package). Oh, and plain greek yogurt – none of this honey or vanilla flavored stuff. 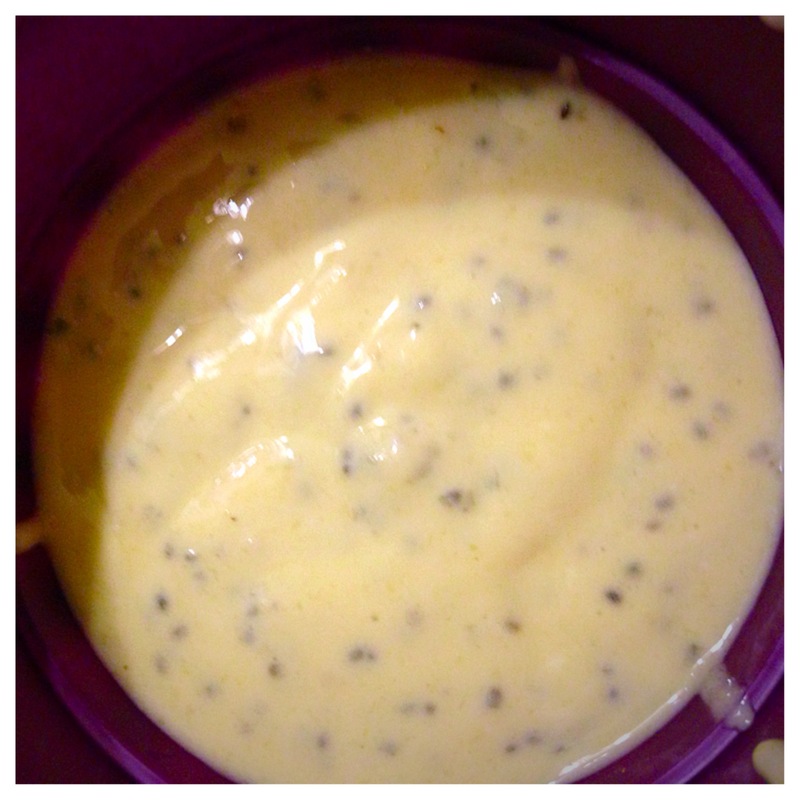 My thoughts on the recipe: This is a really nice, creamy treat that makes a good to-go breakfast. The yogurt provides enough protein to make it last and I really thought it was better with just the natural sweetness of the banana and no honey or yogurt flavoring added. What we changed: We used Great Northern Beans instead of Cannellini Beans because they happened to be less expensive the day we were shopping. 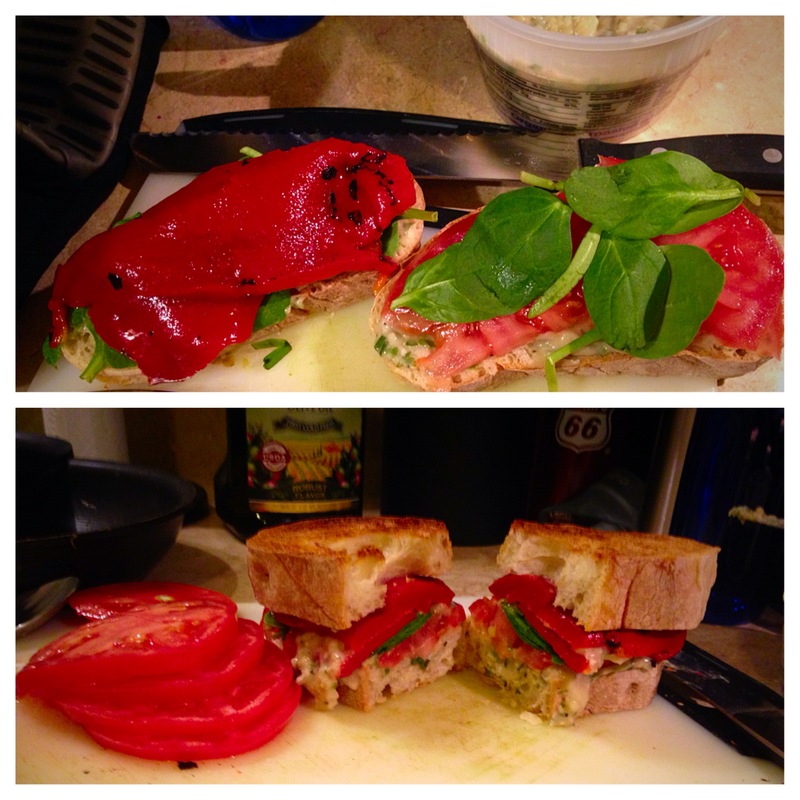 My thoughts on the recipe: I usually don’t go with more than one 10/10 in a week, but man this sandwich was delicious. The recipe says to serve hot, but we were both having lunches to go. So I toasted the bread under the broiler in the morning when I made them, but didn’t end up eating my sandwich hot – it was still really yummy. The bean paste is easy to make and makes enough for several sandwiches. We still have a little leftover that we will probably have with crackers and carrot sticks one afternoon as a snack. We made the bean paste on Sunday night and then didn’t use it until Tuesday morning to make the sandwiches so making ahead is a definite option for this one. What we changed: We used whisky instead of bourbon because that is what we had on hand. My thoughts on the recipe: The recipe doesn’t specify what size of pork tenderloin to get. I don’t think ours was big enough. 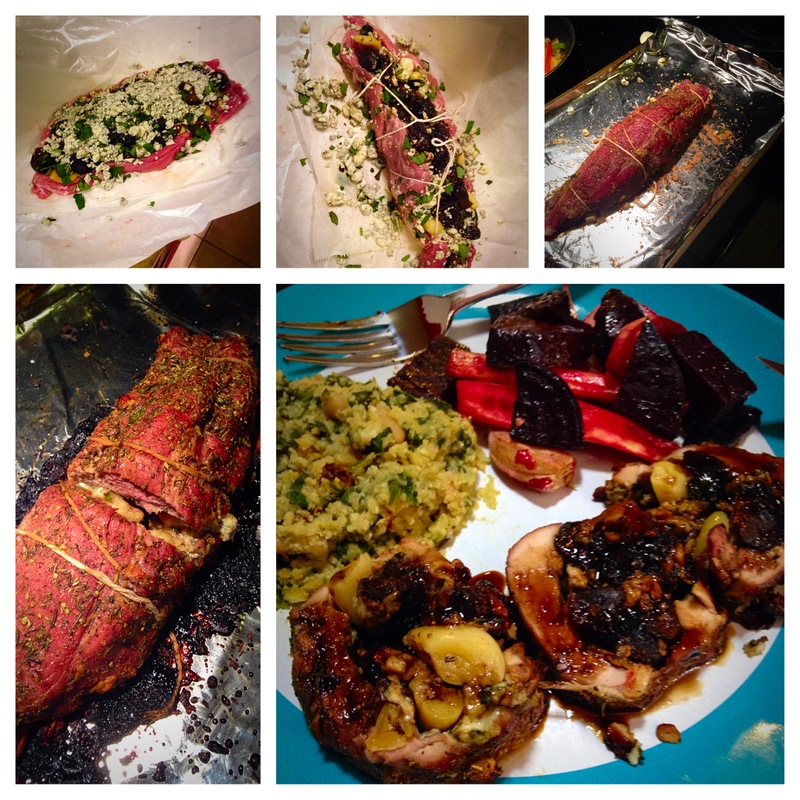 Neither of us had ever tried stuffing a pork tenderloin before so I’m sure there is some sort of a learning curve, but I think slightly more pork would have helped and been a little less frustrating for us (you can see the mess we made in the pics above). Taste-wise, it turned out ok. I think that the sage was a little overwhelming and I think if we make this again I would like to change the brand of gorgonzola we used – but that’s not the fault of the recipe. Overall this was a fun experiment, but not something I want to do regularly. 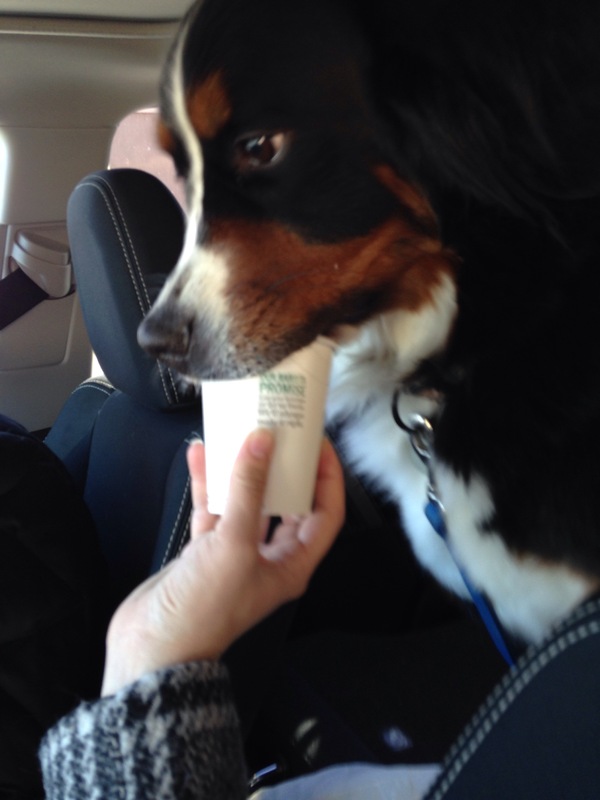 What we changed: I went with the buttermilk option rather than water. I already had some sun-dried tomatoes that were not packed in oil so I chopped them and used them instead of buying oil-packed ones. I used frozen spinach instead of fresh. My thoughts on the recipe: This was my first attempt at a real quiche and I have to admit, it turned out better than I expected. I was a little worried about making the crust from scratch, but her instructions are really good and it ended up being really yummy. I think the crust would actually make a really good crust for a Chicago-style pizza too – might have to try that at some point in the future. I would like to try this recipe again with fresh spinach and a better work surface (I couldn’t roll the crust out as large as I would have liked to). This made a great dinner served with roasted veggies. It also reheated perfectly for a great breakfast. This recipe for zoodles is really great! We made them on Friday night and loved them. They go equally well with tomato sauce or peanut sauce. Next time we will have to try pesto. Go check out Stephanie’s beautiful site and try this one out for yourself. Mamma Mia! Pasta noodles made out of zucchini?! … I certainly have jumped on the zoodles bandwagon- have you? The term ‘zoodles’ refers to the hot health craze of zucchini noodles. This healthy pasta alternative is made using a food spiralizer tool. 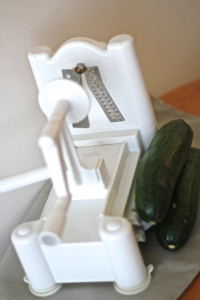 You simply insert the zucchini onto the machine, turn the crank, and voila! Zucchini noodles are created right before you eyes. 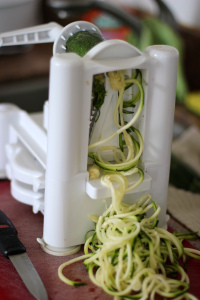 I finally invested in a food spiralizer, and it is definitely one of my favorite kitchen tools yet! They are not that expensive and are really quite versatile. Besides zucchini noodles, you can also create various ribbons and shapes using several other fruits or vegetables. My spiralizer came with 3 different attachments, and I have fun playing around in the kitchen with it. And zoodles taste amazing. Seriously. Who is my dream reader? Well, you are. I’m afraid that is terribly cliche, but it is true. For whatever reason, you have taken the time to visit my little corner of the internet and allowed me to share a part of myself with you. I hope that in doing so you’ve come away with something for you – a smile from one of my dog pics, a new recipe to try out with someone you love, an idea, a new connection, or even just a feeling that you can relate to someone out there. I really do appreciate you dropping by. So here’s another little piece of me for you. I love this song. I hope it makes you smile.